A collection of pictures from various industrial railways across China including Peitun, Yanzhou, Yongcheng, Zaozhuang, Jiawang, Huludao and Bajiaotai. Sandaoling, near Hami in the remote north-western province of Xinjiang, is home to the last steam worked opencast mine railway in the world. Rail operations within the pit are being scaled down as trucks and conveyors take over. Trains over the long line through the desert to the CR interchange went diesel in early 2010 but there are still more working steam locos at Sandaoling than anywhere else on the planet. The railway rosters a mixed fleet of over 20 JS class and a few SY class 2-8-2s. Fuxin, in Liaoning Province, has been a major coal mining centre for many years. The industry is now in steep decline and a number of the area's mines have recently closed, robbing the railway of much of its traffic. The extensive electric system serving the opencast mine has largely closed and the remnants have been dewired. The remaining lines are mainly steam worked, albeit with reduced traffic and a couple of diesels handling some of what remains. The passenger service ceased in mid 2012. 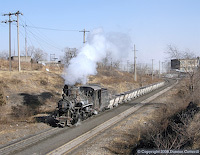 Pingzhuang is home to an extensive mining railway serving five deep coal mines and an opencast pit. The opencast electric system has recently closed but the deep mine system is still active and worked by a small fleet of SY class 2-8-2s. Traffic levels aren’t high but it’s still possible to get some good shots. 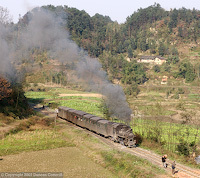 Jixi sits on one of China's major coalfields and there were no less than five steam worked railway systems in the area. 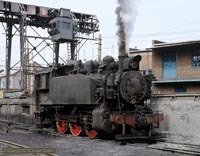 Chengzihe was almost certainly the busiest of the Jixi mine railways with plenty of steam action and some of the best industrial backdrops in China. One of the photographic highlights was the morning shift change at Dongchang when the line's SYs gathered in the yard around 8 o'clock. Electrification work started in 2010. The Didao system is a compact coal mining operation located north-west of Jixi city and is centred on the washery at Didao Hebei. Much of the action was tender first but it was possible to find chimney first workings and impressive industrial backdrops. Didao dieselised in Autumn 2010. 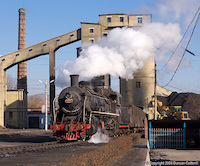 Fula’erji is an industrial town on the Nenjiang (Nen River) about 30 km south-west of Qiqiha’er and is home to a number of large industrial plants, several of which have their own rail systems. This gallery contains pictures of the smart JS class locos working at the No.2 Power Station and the scruffy SY class at the Heilongjiang Chemical Plant. This small coal mining system centred on the town of Beipiao had just received its first diesel a short time before we got there in late 2010. There was still some steam activity but the diesel had already taken over the bulk of the work and a couple of the older SYs were already being scrapped behind the depot. Most of the rest sat in the shed, stone cold and with nothing to do. 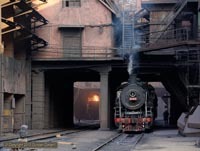 Beitai Steelworks has long been one of the most difficult industrial locations to photograph steam but official visits recently became possible, at a price. 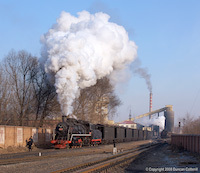 We had a two day visit in November 2011 and found it a fascinating and rewarding place to photograph steam locomotives at work as well as other aspects of the steel production process such as pouring iron and slag tipping. Baotou Steelworks was one of the first industrial locations I visited in China. In the 20 years since that 1988 visit, the locomotive fleet has changed significantly with SYs and diesels replacing the ET7s, JFs, JSs, XK13s and YJs. 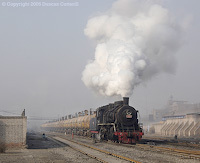 These pictures were taken in March 2008 as steam operations drew to a close. Other pictures from previous trips will be added as time permits. 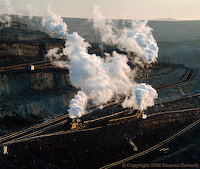 Dayan lies in the far north-east of Inner Mongolia and is the location of a number of coal mines and a power station, all linked by a railway system. The line was totally steam worked until 2006 when the first diesels arrived. Gongwusu is located in western Inner Mongolia, near the border with Ninxia and well off the beaten track. Hardly surprising that it wasn't discovered until 2007 and has seen few western visitors. It's not very busy and gets by with one working engine most of the time. However, there are a few pleasant locations for those who are patient enough to wait for soome action. Donghai is the smallest of the JIxi systems serving a single mine, Donghaikuang, east of Jixi. It does have a long connecting line to CNR but chimney first trains were downhill. The line dieselised in 2010. Meihekou's mining railway was a small operation linking five mines with CR at Heishantou. It wasn’t the busiest or the most scenic line in China but was quite photogenic with relatively uncluttered locations and nicely kept engines. The line is now totally dieselised. Nanpiao's mines are running down and the whole system had an air of decline about it. However, the line is steeply graded and runs through attractive country so it was possible to get good pictures in steam days, particularly if there was some snow on the ground. The line is now totally dieselised. 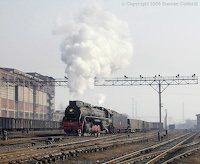 The Pingdingshan Coal Company runs one of the most extensive industrial railways in China. 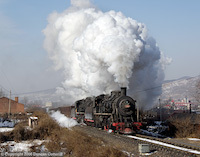 The system serves over a dozen mines in the Pingdingshan and Baofeng areas of Henan Province in central China and used around 20 steam locomotives of three different classes before dieselisation. 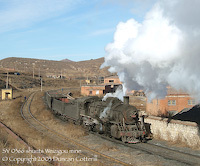 This busy operation links several large coal mines in the Diaobingshan area, north west of Shenyang and was 100% steam worked until 2004. Most of the passengers were still worked by SYs until recently. The area is largely flat and infested with concrete poles, making conventional photography difficult. However, at sunrise and sunset, it came into its own. 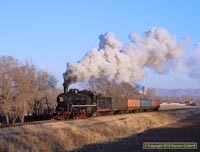 The Yuanbaoshan Mining Railway serves a number of coal mines and a major power station south of Chifeng in eastern Inner Mongolia. 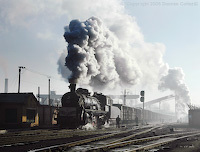 The line's main claim to fame was its fleet of smoke-deflector fitted JS class 2-8-2s. These attractive engines were kept very clean and made excellent photographic subjects.